Lights out: If you have been by The Circle after dark recently, you may have noticed that the lights that usually illuminate the lower pool of the fountain have been dark. An inspection by City of Berkeley electricians has determined that there is a short in the electrical system due to a faulty submerged lighting fixture in the main pool. With the help of donations provided by generous FOFW supporters, we have ordered new replacement parts, and city staff will repair this problem. We hope the fountain will be back to its fully lighted state very soon. Bins are back: Thanks to District 5 Berkeley City Councilmember Sophie Hahn and her staff, and to new neighbors at the corner of Los Angeles and Marin avenues, FOFW has regained the use of four green compost recycling bins we use for the large amount of green waste we collect during our monthly work parties on The Circle and Walk on the first Saturday of each month. Through a series of events involving the sale of a home and the city refuse service updating its records, the bins FOFW had been using for many years were removed a few months ago. 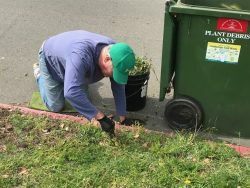 Through the efforts of Councilmember Hahn and her staffer Brandon Norris, working with homeowners Barbara Moses and Mitch Yoffe, we were able to have the bin service restored. The availability of these containers is essential to the maintenance work FOFW volunteers do each month to keep The Circle, Fountain Walk and the surrounding area clean and in good repair. So thanks very much to Sophie, Brandon, Barbara and Mitch! 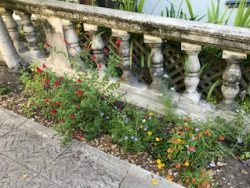 Balustrade repairs: The historic balustrade that surrounds The Circle is showing its age in many places. Large cracks have developed that could threaten its integrity. We have sought out estimates for expert repairs from a pair of well-regarded masonry companies, and hope to have the work underway soon. Again, this preservation work required to keep our landmark neighborhood historic site in good repair is made possible by the generous donations of FOFW supporters. FOFW at 25: Finally, 2018 marks the 25th anniversary of the founding of Friends of the Fountain and Walk. It came into existence in 1993 when neighborhood groups working separately to reclaim overgrown and increasingly decrepit Fountain Walk and to re-create the Fountain at The Circle (the original was destroyed by a runaway truck in 1958) joined forces. A quarter of a century later, FOFW is still going strong: Still an all-volunteer, neighborhood nonprofit partnering with the city to care for the great public treasures it helped revive. To mark our 25th year, we are planning a public gathering and celebration for later this year. Details are still being worked out, but will be announced soon. Stay tuned! As always, thanks to everyone who supports FOFW’s efforts. 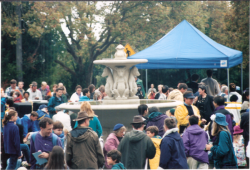 And, as always, you can find out more about us, our history and our mission – and how to get involved — on our website: berkeleyfountain.org.